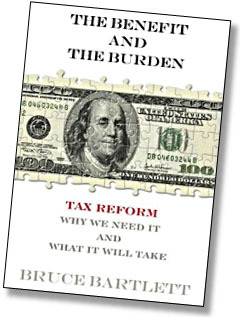 Last night I read Bruce Bartlett’s new book, The Benefit and The Burden: Tax Reform-Why We Need It and What It Will Take. It’s written as a primer on American taxes, and it’s a great introduction for anyone who doesn’t really know much about the U.S.
tax system and wants to learn the basics. It’s clear, short, and a quick read. Still, I confess that I was sort of charmed by Bruce’s apparent optimism that genuine tax reform will be on the table after the election is over. “Genuine,” of course, means broadening the tax base and getting rid of loopholes and deductions, and being revenue neutral at a minimum. In other words, it’s not a tax cut. What are the odds of that? Pretty slim. And yet, what do I see when I open my copy of the LA Times this morning? President Obama will use his State of the Union address this evening to make a renewed case for an overhaul of the tax reform, one of a host of “common sense” ideas advisers say he’ll offer to shore up the American economy and tackle the growing deficit. I still don’t believe this is going to happen. Republicans are simply too deeply invested in the theology of both tax cuts and corporatism to cooperate on anything resembling genuine tax reform. It’s not 1986 anymore. Still, you never know. And it certainly demonstrates that Bruce has freakishly great timing. Tonight people will tune in to the State of the Union address and hear Obama calling for comprehensive tax reform, and tomorrow they’ll all stampede to their local Barnes & Noble to find a nice, short book that explains what tax reform is all about. Bruce will become an overnight millionaire, right?